Is your home’s kitchen where members of the family gather and assemble? More often than not, our cooking spaces do more than simply offer a place to prepare and cook food – they are hubs of the home, the beating heart of a comfortable, inviting and warm abode. Kitchen islands go hand in hand with this notion, and offer a spacious yet stylish environment that promotes congregating and mingling, without compromising on efficiency. Thanks to the kitchen island’s design, they support a sense of roominess, while improving on the existing distribution of space. Ideal for eating, preparing food or gathering with friends and family, the kitchen island is an integrated feature that is definitely worth its weight in design gold. 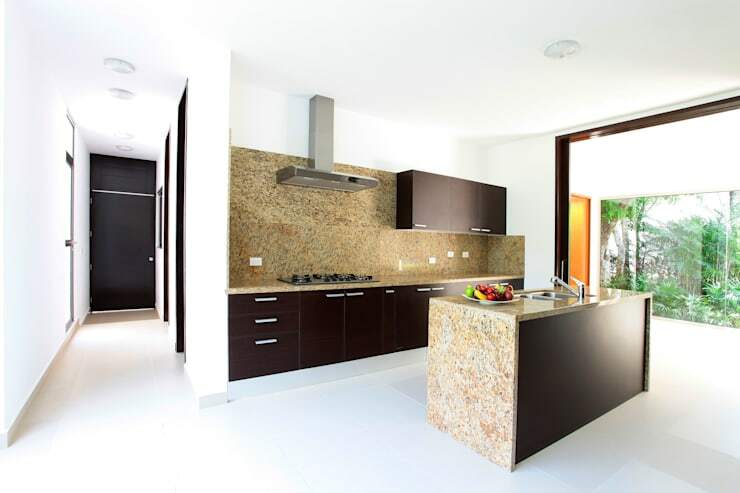 Would you like to take a peek at some successful islands in gorgeous kitchens? Read on below and pick your favourite! Our first kitchen island is well-illuminated, comfortable and boasts a gorgeous combination of both brown and white hues. This ensures it is engaging to its occupants, while practical and efficient also. With the stone work acting as the main protagonist within this kitchen setup, it’s not hard to see why this is such a successful example. 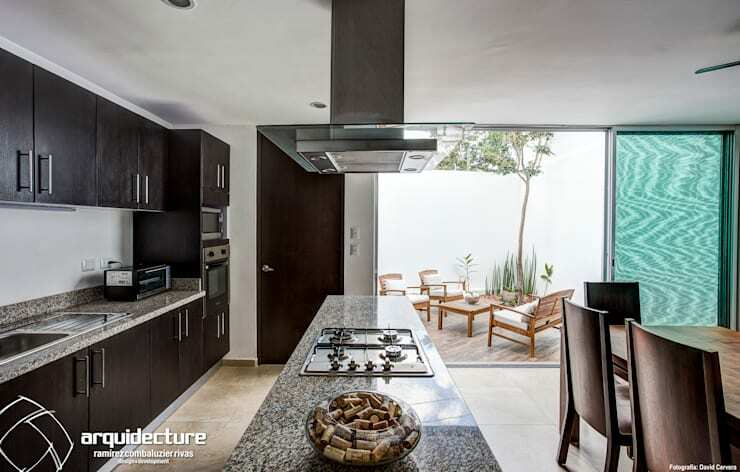 The designers have employed natural materials along with a timeless pairing of brown and white to create a light-filled, minimalist space. Be original, be bold and innovate. 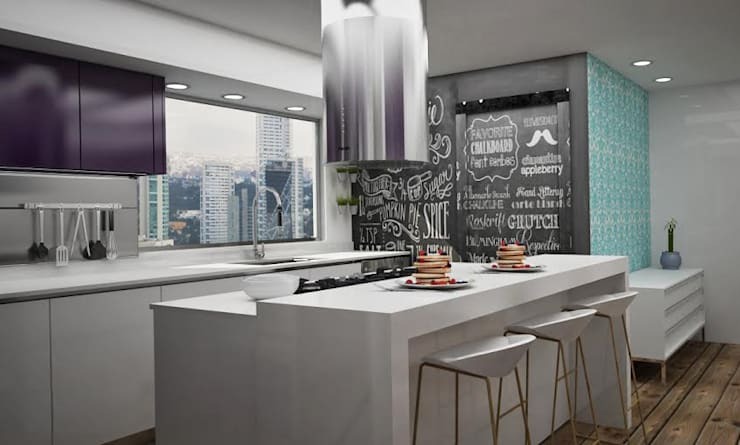 This kitchen does just that with a statement exhaust hood, chalkboard wall, purple overhead joinery and a modular kitchen island. 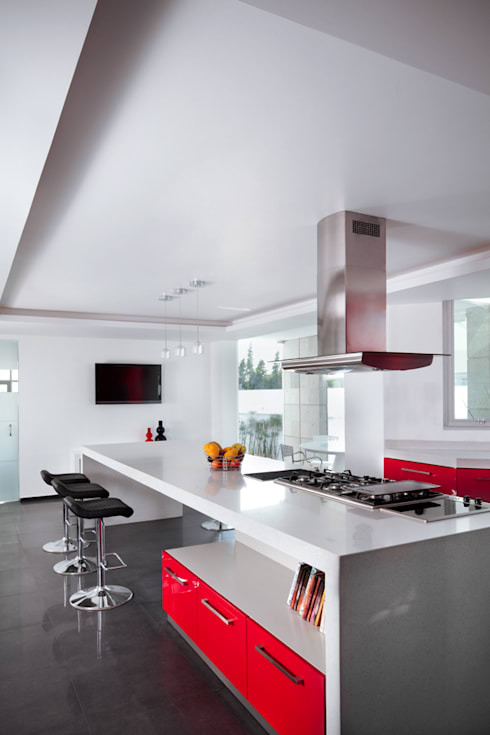 Colour is injected into this home with bright red joinery that sits elegantly in the centre of the island, and also the surrounding cupboards. Perfect for gathering everyone together, this island offers a central cooker, with a large and welcoming space for guests to sit and watch. 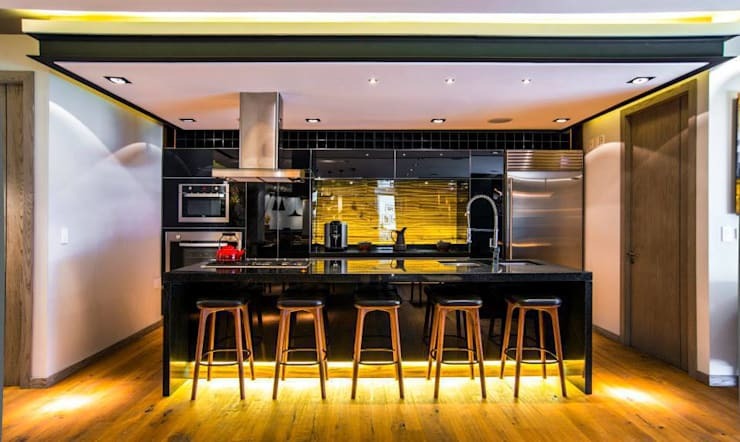 One of my personal favourites, this well-illuminated cooking space offers recessed floor lighting underneath the island, along with seating for 5 that overlooks the sleek black island with cooktop and sink. As we’ve mentioned previously, a kitchen island can boast more than simply a preparation space. 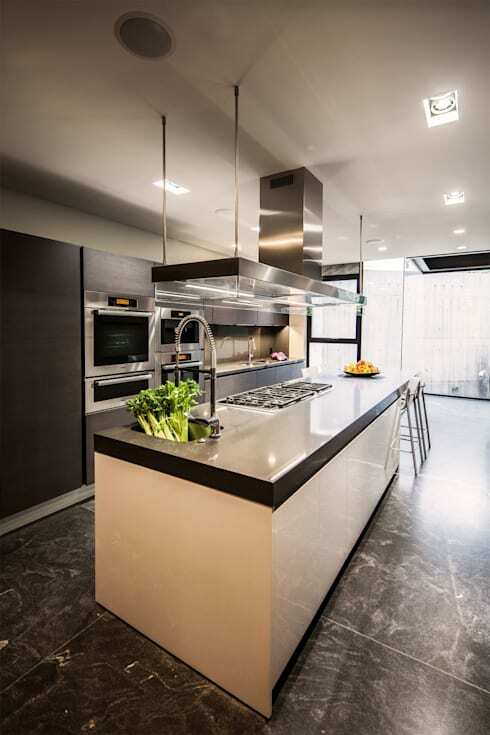 Here in this example it houses the cooktop, which is serviced by a central exhaust hood, extracting any unwanted odours or smells from the room. The devil is certainly in the detail! 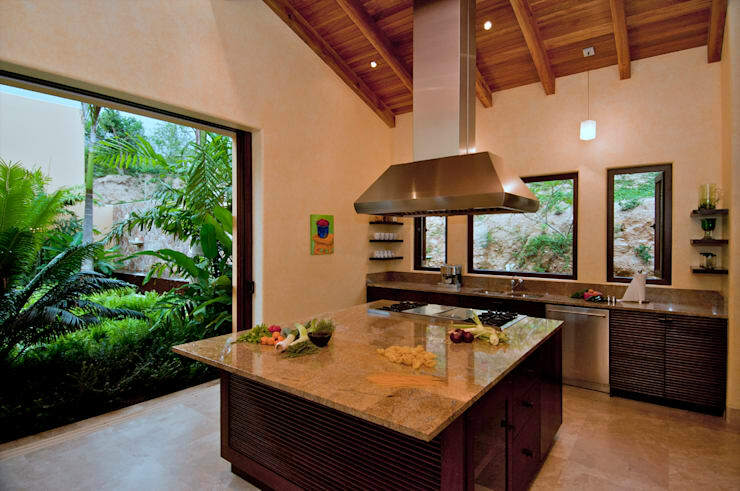 In this cooking space the island houses virtually everything one might require to cook a culinary masterpiece. As well as an additional sink for washing vegetables, the island includes lighting, and a place for everyone to sit. This wide island is eye-catching and rustic. With a large number of drawers for storage, the space acts in a practical way, as well as looking lavish, opulent and luxurious. 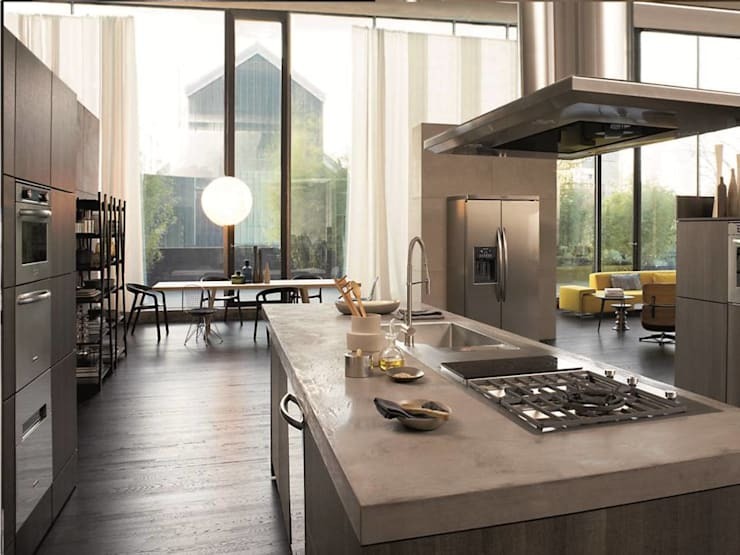 Want that industrial aesthetic that comes with chef-style cook spaces and commercial grade kitchens? 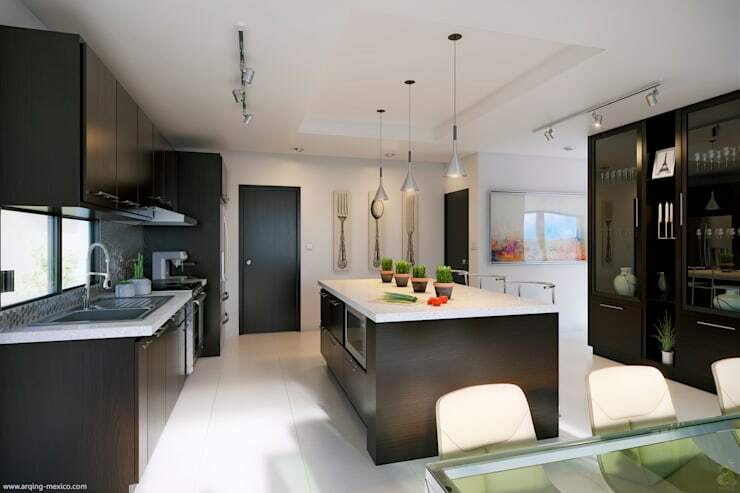 Take some cues from this example and place all of your cooking instrumentation in the centre island, reserving the walls for storage and ovens. 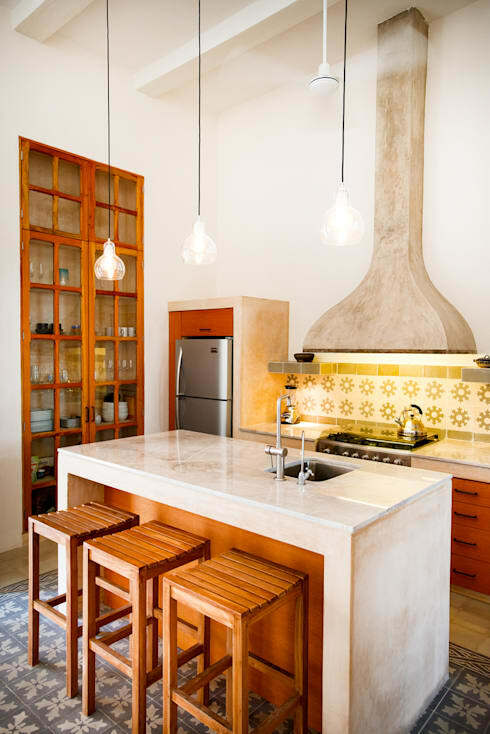 Lastly, we head inside a rustic kitchen that boasts a beautiful yet compact island. Size certainly doesn’t matter here, with a small sink and seating for 3 providing a gorgeously warm and welcoming ambience. Do you have a favourite kitchen from the above examples?